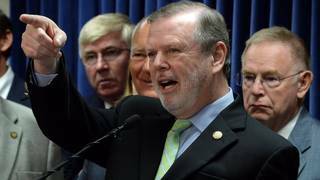 Phil Berger and some of "His Boys"
HB656 (Already enacted): Canceled primary elections for judges, making general election ballots longer and more confusing. The first step toward canceling judicial elections altogether and letting politicians appoint judges instead of voters. This act is being challenged in court. HB717 (Passed by House): Gerrymanders the judicial system, just like they did with unconstitutional legislative maps. Nearly half of all black judges would be packed into a district with another incumbent, forcing them to run against each other or step down. SB698 (Introduced): Cuts all judges’ terms to two years, forcing judges to campaign and hold political fundraisers instead of dispensing justice. A judge elected to an eight-year term in 2016 would be forced to run again in 2018 after having their term cut. Legislative Appointment of Judges (Proposed): Eliminates judicial elections altogether, letting politicians rig the system by cherry-picking judges who will rule based on political ideology and rubber-stamp a radical partisan agenda. If your candidates for judges were so worthy, wouldn't they be elected or re-elected easily? Shouldn't be a problem for honest, Constitutional, law abiding judges,right? Or do you want your judges to make law from the bench, and that's why you're worried? I think fair and equitable elections, rather than jury-rigged, is the point. Then let the best candidates win.